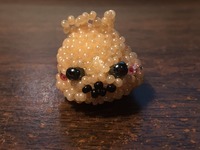 [fanart] [1/2 Prince] meatbun 3d bead art | Prince Revolution! I'm slightly disappointed with how it turned out...doesn't really look like meatbun. I restarted at least 3 times trying to do it in different styles. For meatbun's round body I found that using fishing line along with a circle pattern was better than how I made Ohmygod before. Meatbun's eyes was a killer compared to ohmygod's dot eyes. 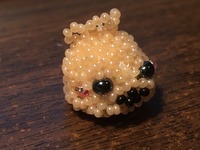 I ended up just using a big bead for meatbun's eyes. If anyone has recommendations on how to make it better I'm all ears!! Thank you for the feedback! if I somehow find time to make another meatbun I'll keep what you said in mind! It's kinda cute in itself although it doesn't look much like meatbun. When I look at it, I see a chihuahua... Am I the only one?